A weed is but an unloved flower – Ella Wilcox (American poet). and Cosmos flowers (Cosmos bipinnatus) in South Africa that we seldom even think about whether or not they belong here. All three plants grow in fallow lands, flourish in disturbed ground and are generally regarded as weeds by farmers and gardeners alike. Unsurprisingly, the cosmos is also known as mieliepes (mealie/maize pest) by farmers. All are listed as alien invasive species in this country. Their history is interesting, given that they originated in Central America and took root in this country over a century ago. This came about through the Anglo-Boer War (1899-1902) when the British forces imported fodder for their horses from Argentina and Mexico. It is this fodder that contained the seeds of these plants that initially established themselves in the areas that saw action during the war – imagine if one could go back in time to track the paths these plants took root in first and compare these with the movement of the troops! 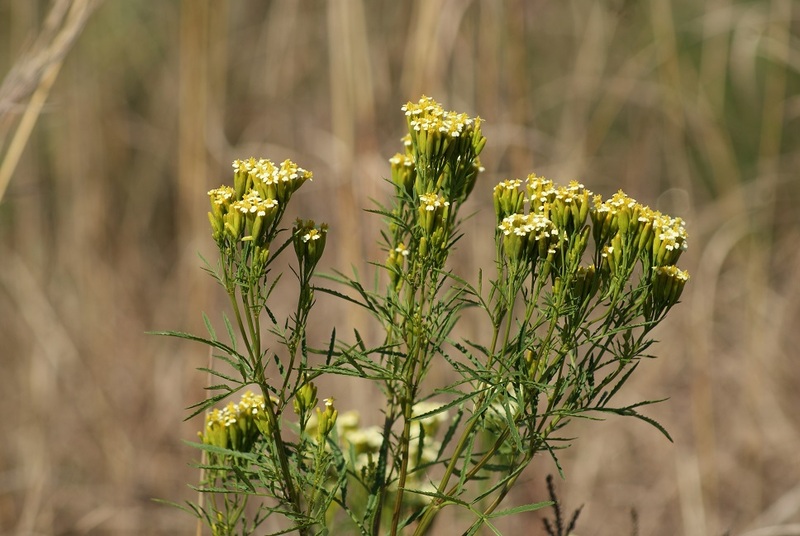 Khakibos, otherwise known as Mexican Marigold, is particularly interesting given the above context. Its common name derives from the khaki uniforms the British troops wore during the Anglo-Boer War – in sharp contrast to the traditional red and white uniforms worn during the earlier Anglo-Transvaal War (1880-1881) – which gave rise to them being dubbed ‘Khakis’ by the Boers. 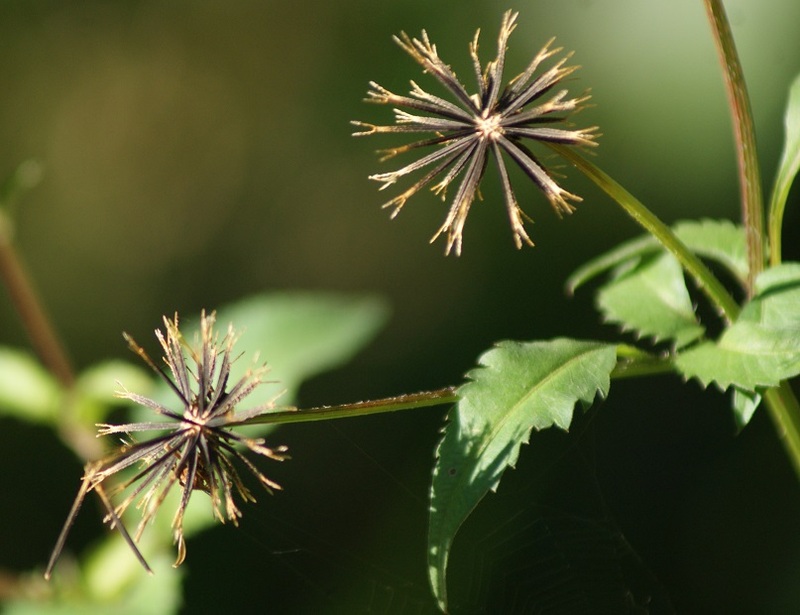 Despite being invasive alien plants, they have been put to good use over time. Khakibos has long been used as a tick and flea repellent – I can remember besoms being made of khakibos to sweep around the farm yard and laying khakibos in the farmhouse before it was closed for long periods of time in order to limit the presence of fleas. These days it forms an important ingredient in many pet shampoos and other products, for example. It is thus actually cultivated in order to extract essential oils by means of steam distillation. While I recall feeding blackjack plants to our chickens after a bout of weeding, I was astounded to discover the other day that this weed is cultivated in parts of this country as a nutritious food crop! 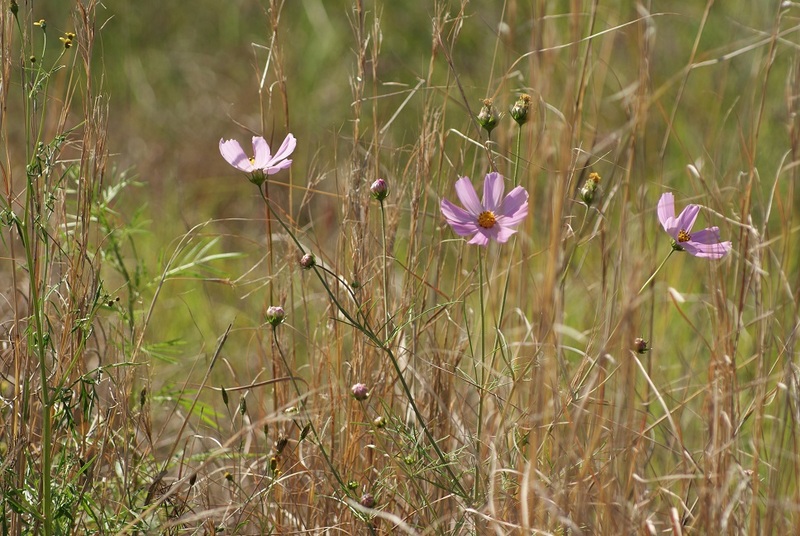 During its flowering season the Highveld is transformed into a land of beauty as cosmos blossoms of several hues dance about in the lands and beckon the attention of travellers by growing en masse along the road verges too. These days gardeners can purchase commercially produced cosmos seeds to brighten a bed or two. This is how these naturalised aliens came to be a familiar part of our landscape so long ago. This entry was posted in Garden, Travel and tagged Anglo-Boer War, Anglo-Transvaal War, common blackjack, cosmos, khakibos, weeds. Bookmark the permalink. Thank you Joy. There are so many pointers to our history in the form of such plants, implements, shards of pottery, and trees – even the presence of bird species such as the Common (European) Starling – apart from the obvious diaries, letters and photographs. I’ve planted cosmos here in Iowa. They used to be considered a garden flower, and the birds love them. Anne, you are my first responder to my first ever blog. As such I treasure you, and think it funny you are so far away. All the better. If one is going to step onto the web, might as well lead to Africa rather than Los Angeles, our nearest city. We are north of it. I need to take pictures, I can see that. I’ll use your blog as a model. Such kind words from you Julie. Pictures are always interesting to see, but much depends on what you are wishing to convey. I hope you will enjoy blogging and that once you find your ‘voice’ you will feel free to stray onto whatever topic happens to be interesting at the time. That’s so interesting. I love reading ‘history with a twist’. It brings it alive , even though I’ve never visited your part of the world. Thank you. What a lovely and informative blog. Really interesting. I think the cosmos(es?) is such a beautiful flower. I remember we had lots of them in bloom when we lived in the mountains of Bulgaria. And I love the ‘unloved flower’ quote. So true! I have enjoyed reading your posts about de-cluttering. I suppose weeds are a bit like that too. Cosmos flowers are so lovely that we can now purchase cosmos seeds for our gardens.